Reynolds American, Inc. (NYSE: RAI) shares reached a new 52-week high of $56.21. British American Tobacco PLC (ADR) (NYSE: BTI) made a $47 billion takeover offer for the roughly 58 percent of Reynolds American that it doesn’t already own — a move that would cement the two cigarette giants’ longstanding trans-Atlantic ties and create the world’s largest listed tobacco company by revenue and market value. BAT owns 42.2 percent of Reynolds, and is offering cash and BAT stock worth $56.50 a share for the rest of the company. LATAM Airlines Group SA (ADR) (NYSE: LFL) shares reached a new 52-week high of $9.44. Santander upgraded LATAM Airlines from Hold to Buy. 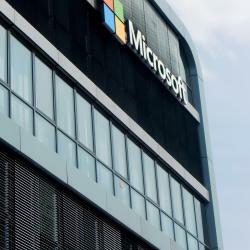 Microsoft Corporation (NASDAQ: MSFT) shares touched a new 52-week high of $59.945 as the company reported stronger-than-expected results for its first quarter on Thursday. Paypal Holdings Inc (NASDAQ: PYPL) shares gained 7.3 percent to touch a new 52-week high of $43.00. Paypal reported in-line earnings for its third quarter, while revenue beat analysts’ estimates.